The speculation about a Nokia Android smartphone has been building, and today at MWC in Barcelona we learned about three of them. 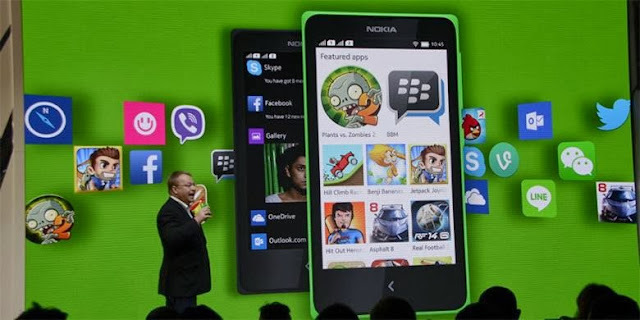 Nokia CEO, Stephen Elop unveiled the Nokia X, the Nokia X+, and the Nokia XL. The Nokia XL features a 5-inch IPS WVGA display, a 5-megapixel rear camera with LED flash and auto-focus and a 2-megapixel front camera. The Nokia X and the Nokia X+ both have 4-inch touchscreens and Nokia’s signature mono-body design in various colors. The difference between the two is that the X+ has additional memory and expandable storage via a microSD card. All three smartphones are running AOSP, Android Open Source Project code, which means they are Android devices, but without Google services. They will come pre-loaded with Nokia and Microsoft services including navigation with Here Maps, MixRadio for music, Outlook.com email, one month of free calls on Skype, and access to cloud storage with 10GB of free OneDrive space. The Nokia X, X+, and XL will also have popular apps like Facebook, Twitter, Vine, BBM, and Plants vs Zombies pre-installed. Customers will be able to get more apps from the Nokia Store. They can also download apps from third-party store partners like the Russian Yandex Store and Slideme. In addition it will be possible to sideload apps using a MicroSD card. The user interface has been deliberately designed to match Lumia devices. There’s a glance screen showing the time and notifications. You swipe left to get to your tile-based home screen, which is customizable, much like Windows Phone. There’s also Nokia’s unified stream called Fastlane, which puts notifications and recent apps together for quick access. These devices are being aimed squarely at growing markets and are intended as entry-level smartphones that will act as a feeder for the Lumia brand. Elop expects people to get used to Microsoft’s services with the X family and to upgrade to Lumia devices down the line. To that end the X smartphones will be priced more cheaply than the Lumia line. The Nokia X is available now for $122 (90 euros). The Nokia X+ will be available sometime in the second quarter for $136 (100 euros). The Nokia XL will also be on sale in the second quarter for $150 (110 euros).